Though we had chickens, ducks and other poultry in the past, it was always part of the traditional "coop & run" system that depended on outside input and we got rid of them years ago. But after listening to Jack and Geoff and seeing how they can be used more sustainably, ie tractors, paddocks etc I want to try again. A friend of mine needed an alder tree in her yard cut down and in return (along with getting to keep the wood for smoking meats!! ) she gave me 3 laying Silver Laced Wyandotte hens! 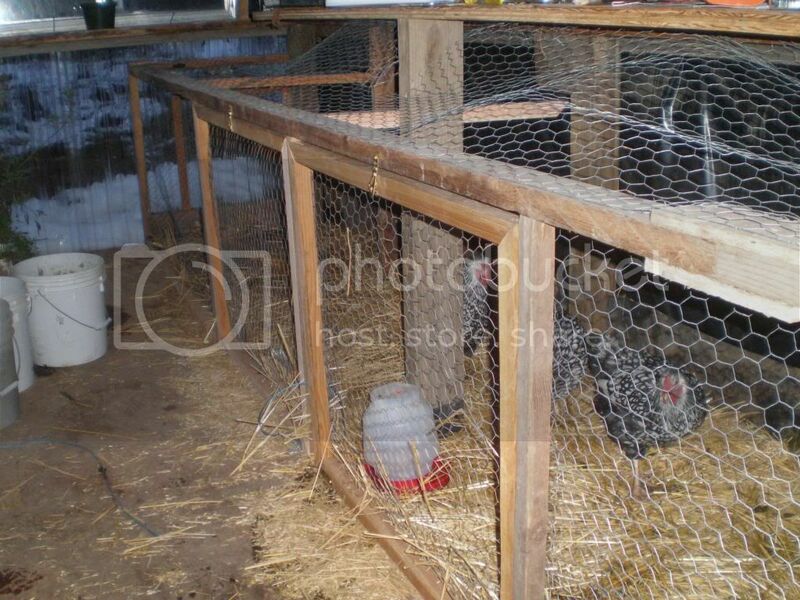 I've built a 3' H x 3' W x 16' L coop against the west wall in my greenhouse for now but am looking to avoid as much purchased food as possible after a transitional period (she fed them Purina Layena pellets) as well as get them some exercise. The main problem is that winter is here in North Idaho and we do get 4'+ of snow cover on a regular annual basis. Also I live out in the woods and the predators get mighty hungry so keeping them safe will be a MAJOR concern. A secure tractor seems to be the best arrangement and I'm in the process of getting some materials together. There's only the "Huntress" and I in the household, besides the 5 dogs, so there aren't going to be a whole lot of table scraps to share with them. If anyone in the northlands has "sustainable chicken wintering experience" to share or can point me to some good threads here or other links, Id greatly appreciate it. I've already gotten 5 eggs off of my new "girls" over the past week and it's SO nice to be eating fresh eggs again, even if they aren't from "scratch". Thanks in advance for your help!! 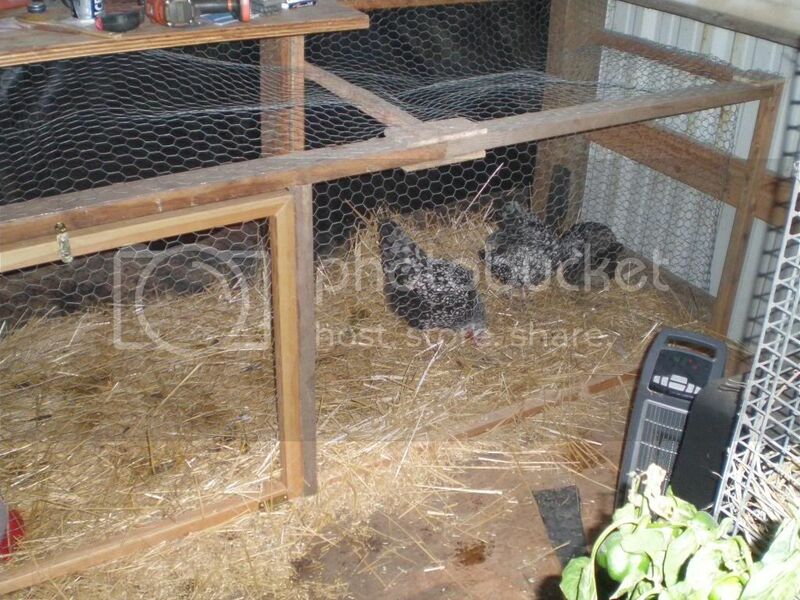 Just a couple of pix of the hens and where I have them for now. I plan to add a "doggie door" at the clear/south end for easy loading into a tractor and some roosts this weekend as time/weather permits. Other suggestions gratefully accepted. Thanks for the feedback FromScratchWoman. Yeah, I know that very soon letting the hens forage will be all but impossible but I hope to get them out in the garden and my "woody bed" for at least a bit before much more snow flies as temps are "supposed to" remain above freezing for the next week or so. Wish I'd known about getting these birds a couple of months ago, would have given me a chance to harvest seed heads from the mullein and other wildcraft plants here on the property & surrounding land. Oh well, is what it is. At least I've got the winter now to start looking at seed catalogs (Terrior?) and planning some plantings for next year. After listening to Jack over a few episodes in the past, I've managed to gather a bunch of leaves (with no raking on my part ) and have spread them over the garden to mulch over the winter. Would it be better to let the leaves sit and compress & break down under the snow and then put the chickens out in say late March or so (after the thaw) before planting in May? I would vote now they will help break down the leaves and if you do it in the spring their dropping may not have time to compost and they will be to "hot"..
Every deer season, after "our" meat is cut off of the deer, I toss the chickens a leg, which they promptly go about picking clean. I scrape the remaining deer bones and put the scraps in small ziplock bags portioned for just the chickens and ducks, and over the course of the winter I thaw out a package every few days for them. They LOVE deer meat. They will also eat squirrel and rabbit meat, and even mice if they can catch them. I also raise meal worms (left over from my hedgehog raising days), which are not only high in protein, but very high in fat, which is especially helpful in combating winter's icy blasts. ..., after "our" meat is cut off of the deer, I toss the chickens a leg, which they promptly go about picking clean. I scrape the remaining deer bones and put the scraps in small ziplock bags portioned for just the chickens and ducks, and over the course of the winter I thaw out a package every few days for them. They LOVE deer meat. They will also eat squirrel and rabbit meat, and even mice if they can catch them. I also raise meal worms (left over from my hedgehog raising days), which are not only high in protein, but very high in fat, which is especially helpful in combating winter's icy blasts. Thanks for the tips about the venison, especially since it's that time of year up here! Definitely a way to more fully utilize some of the stuff that we generally don't use like the between the ribs & lower legs. Yeah, I remember the chickens racing after mice when we had them before and gobbling down the "pinkies" when a nest got uncovered during mucking out. Anything to help save money and approach more natural nutrition. Thanks!